Please note that the content of this book primarily consists of articles available from Wikipedia or other free sources online. 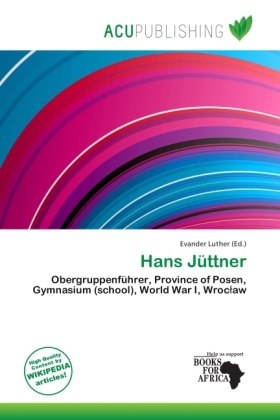 Hans Jüttner (2 March 1894 24 May 1965) was head of the SS's Main Leadership Office and also an SS Obergruppenführer.Jüttner was born in Schmiegel ( migiel) in the Province of Posen. After finishing Gymnasium, Jüttner joined the army as a volunteer and took part in World War I. By 1915 he had been promoted to lieutenant, and he was discharged from the army in 1920 with the rank of first lieutenant. To keep his head above water financially, he worked as a salesman, from 1928 as a freelancer.